This entry was posted in Movie, Poll, True Story, War Movie and tagged Controversy, Discussion, Historical accuracy, Movie, Political correctness, Poll, the N***** word, True Story, War Movies. Yes a poll! It is sad that the actual dog’s name was that name. And I know in today’s world it isn’t acceptable. It shouldn’t have been then either, but that is a different matter. But to change history since it might offend, like you said, where do you stop. I faintly remember an edition of Huck Fin that was released without the word. This is one of my favorite books, and not that I relish that Twain used the word, but it was part of the story. And a big part. The name shows insight into the person, in a way, I think changing the name also involves changing the person into something he wasn’t. 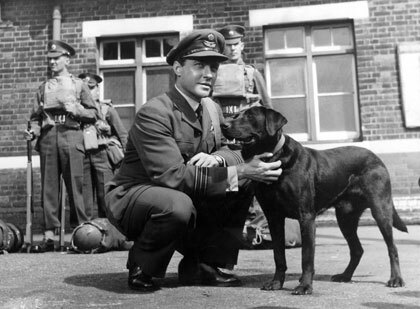 It would be in bad taste to call a dog like that nowadays, while it was probabaly not OK then either, it doesn’t even mean that the Wing Commander was a racist. Maybe it was meant as a very silly joke. Should the dog be renamed, the movie can still be appreciated but Huck Fin should never have to undergo such changes. That’s very close to saying – we cannot write about slavery because slavery is horrible and wrong. Of course it is but we have to talk about it. Exactly. We need to talk about past sins. How else do we learn? A recent edition of Huck Finn did substitute the word “slave” for the n word. I totally disagree with this because you are tampering with a literary classic. I do not think there is an equivalency when talking about the name of a dog in an old WWII movie. My opinion is that although I am definitely a stickler for historical accuracy, I also regret the rareness of war movies these days. The way I see it is a remake of TDB would be less likely to be successful if Jackson insisted on offending part of his potential audience. Look at it this way, few would refuse to see the movie because they changed the name of the dog, but I could see where the controversy of sticking with the n word could reduce ticket sales. It is risky enough remaking this movie, why take that kind of financial risk? Because some lovers of the original want purity? Those people are going to see the movie anyway and don’t lie and say otherwise. BUT -this is not just an old war movie, it’s a movie based on a true story. I might still watch it -but frankly- for me it is already flawed. Every time I will hear the dog’s name, I will be annoyed. If people feel offended for something lie this, ten they should fell offended. I find it much more appaling that racism still exists… Despite the changing of words. And I even think that this – to me hypocrite approach – is just one more way to try to cover up that things are still so very wrong. If African Americans were by now treated equally and wouldn’t feel discriminated anymore – I?m pretty sure they would not take offence in the name of a dog. You cannot change the fact that the term is offensive. You are looking at the issue from an intellectual viewpoint instead of a practical, financial viewpoint. No one has mentioned that use of the term in 1940s England indicates that even the upper classes in England were racist. Perhaps the English might want to keep that fact forgotten. Of course I do think of it in an intellectual way. I was thinking of leaving out the name as a solution as well. Here boy, would be better. Yes, indeed, the code name would have to be changed as well. On behalf of morticians, I strongly protest the renaming of the dog to “Digger”! Actually, there’s a couple in New Jersey who named their son Adolf Hitler and their daughter JoyceLynn Aryan Nation. I’m not sure this would be possible here. There are pretty strict regulations as to the choice of names for your children. It’s in really bad taste. I agree with WarMovieBuff, the movie simply can not be made if they keep the name. I hate, really hate, modern whitewashing of history, but perspective is important. The dog’s name was said often, but the name itself was not important at the time because racial attitudes were different. However, changing the name is not the same as making Mel Gibson’s character a non-slaveowner in the Patriot. I get your point – and his – still I would prefer if they did not call him anything but “Boy”. But – in the UK tthe dog is famous. 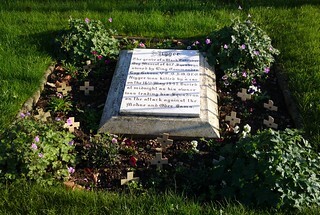 His grave is visited, to rename him is to rob him of his identity. I have a feeling that most Europeans are foer keeping the name while in the US people are afraid it could be seen as offensive.